Welcome to A10 Talk’s Top 25 Player Countdown. Each day, we publish a new article counting down the 25 best players in the Atlantic 10 this past season. Today, we feature #17 Trey Davis. Trey Davis had an excellent senior season for Massachusetts, leading the Minutemen in points per game, assists per game, and he finished second in rebounds per game. The guard did all he could for UMass, but a 7 game skid in the middle of the season kept the Minutemen away from postseason play. 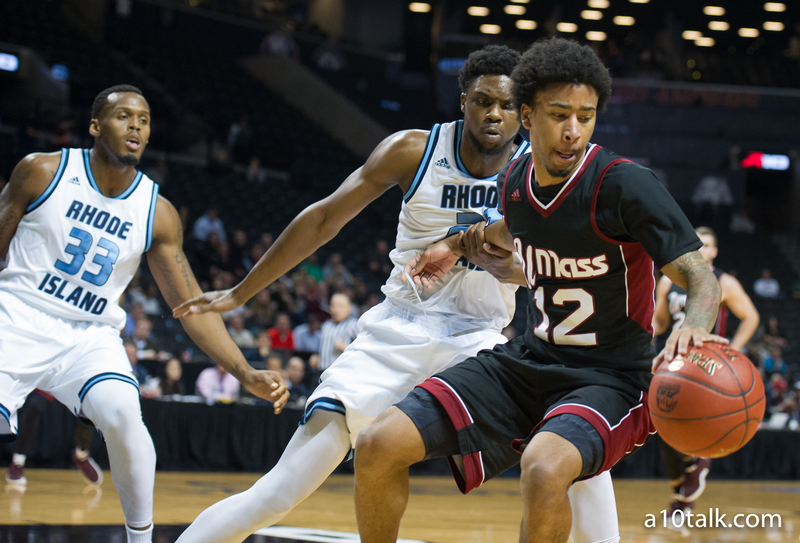 Trey Davis had some great performances for UMass throughout his senior season. Though he had a few off nights, Davis had some 25+ point performances that lifted the Minutemen to some big wins. Davis broke the 25 point mark an incredible 8 times in the 2015-16 season. Trey Davis’ season-high in scoring came against New Orleans when he scored a whopping 40 points and even dished out 3 assists and reeled in 6 rebounds. He also had a 26 point and 8 assist night against Duquesne that helped UMass take down the Dukes in overtime. The tough part for UMass is that it still fell short in games where Trey Davis scored 30+ points. Trey went for 30 and 36 in back-to-back performances against Davidson and Saint Louis, but the Minutemen would lose both games by double figures. Davis scored 26 points, had 4 assists, and grabbed 6 boards against the Bonnies, but UMass still lost in a tight battle. The senior guard certainly knew how to put the ball in the basket, and his ability to score 20+ points on any given night allowed the Minutemen to stay somewhat competitive in the Atlantic 10 Conference. Trey Davis had such a great year statistically because he basically led this team in every category. Davis saw the most court time with 34.0 minutes per game. He led this UMass team in scoring with 18.7 points per contest. He also led the way in assists per game and free throw percentage and was second in rebounds per game and three point percentage. A player that can affect all facets of the game is a huge asset, and coach Kellogg is certainly going to miss Trey Davis for that reason. Davis put his team on his back to win some big games, but the Minutemen just got outplayed for a majority of the season and were unable to pull it all together. Regardless, there are a lot of positives for this team moving forward. The Minutemen return some very talented players in Donte Clark and Rashaan Holloway. In addition, UMass has an excellent incoming recruiting class that’s going to make some noise within the next few seasons. Though Massachusetts wasn’t able to have the 2015-16 season it would’ve hoped to have had, Trey Davis was an outstanding player that gave this team a fighting chance the whole way. Come start a thread on our forum to talk more about UMass basketball!